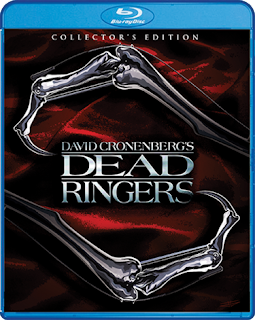 Scream keeps the announcement train running with the announcement of the special features for Dead Ringers, coming to blu-ray on November 15th, 2016. Claire Niveau (Geneviève Bujold) is in love with handsome Beverly. Or does she love Elliot? It's uncertain because brothers Beverly and Elliot Mantle are identical twins sharing the same medical practice, apartment and women – including unsuspecting Claire. In portrayals that won the New York Film Critics Circle Best Actor Award, Jeremy Irons plays twin gynecologists whose emotional dependency collapses into mind games, madness and murder. David Cronenberg (The Fly) won the Los Angeles Film Critics Awards Best Director honors for melding split-screen techniques, body doubles and Iron's uncanny acting into an eerie, fact-based tale.